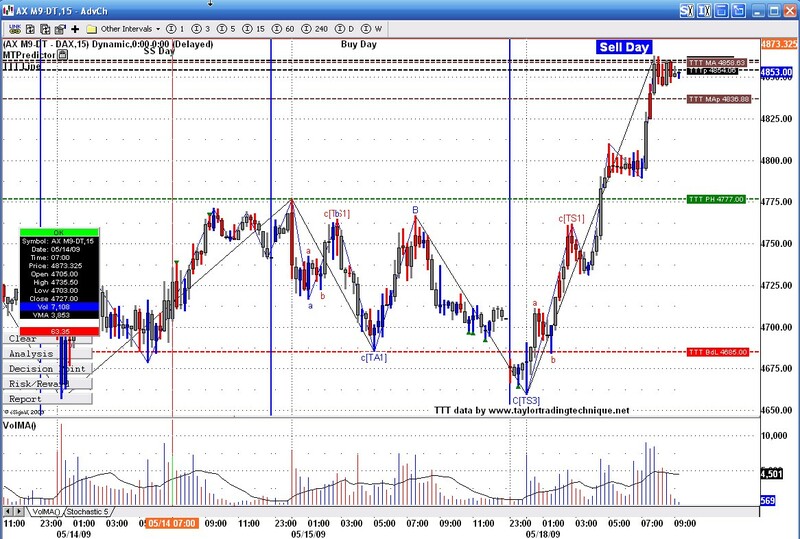 Today on the DAX was a Buy day. On Buy day we should expect a decline from the SS day high. 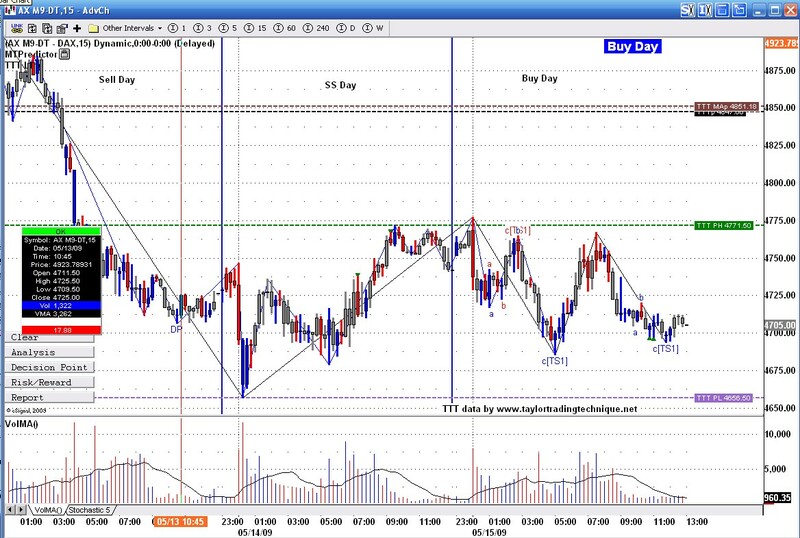 In this case DAX close on the highs on the SS day therefore the decline had to be on the Buy day. They tested the highs a few times and we had 2 chances for a decline. I hope that this weeks day by day review of the DAX has helped. Great Chart Rich, what a rally, they have kept it going today SS day as well, selling off somewhat now during lunch period. Understand one would only be looking for shorts or would you have gone long during the first 60min , that is if you were trading this market. Being day traders we can go long on SS days however it is not what Taylor recommends. When I do take trades against the rules I just make sure my stop is close by and I usualy take profits sooner or at least protect my profits as soon as possible. Not quite sure what DP is, could not find any info. on that in Taylor's book. Is it something to do with Elliot. 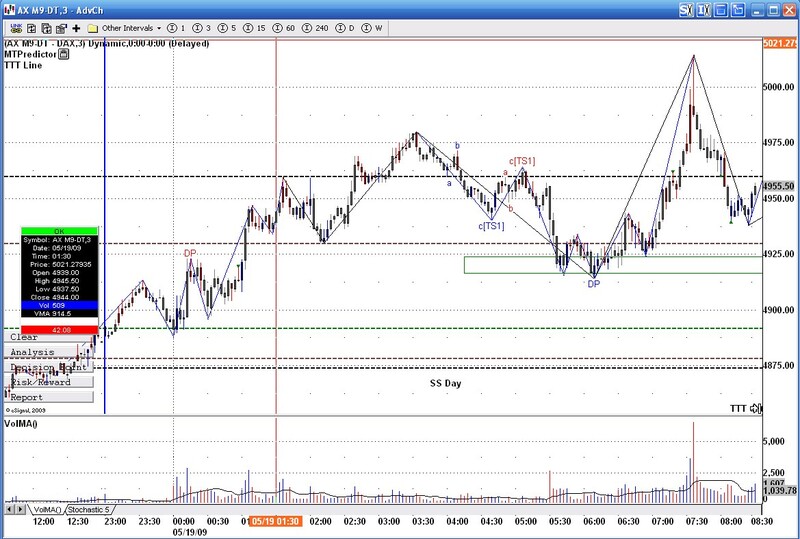 Although Taylor does not permit longs on SS day, if DP is indicating that a long is in order for intraday purposes then should not that be taken. Today Buy day, some ideal shorts at high of previous day on Euro markets have shown up. DP stands for Decision Point. It has nothing to do with Taylor. It is part of a software called MTPredictor which is based on Elliot Waves.